In a place not far away nor a time long ago, a young Benedictine priest driving a beat up pick-up truck approached a young mother and asked her if she would be interested in starting a youth group for the parish. So began the journey of Fr. Dan Homan and Mary Kay Cummings. In 1972, Fr. Dan and Mary established a youth group at St. Scolastica, a parish run by the Benedictines on Detroit's northwest side. Following Vatican II Catholic youth groups were something new, nobody had any experience of how they were suppose to work. Books on youth ministry had yet to be written. At first they met in each others houses but when the group became to large they moved into the parish facilities. Small group discussions, games, prayer, and service projects made for the basic structure for these gatherings. In the mid-1970s Fr. Dan was called back to the monastery in Oxford and plans were soon begun to create a retreat house for the growing youth ministry programs in the Diocese. 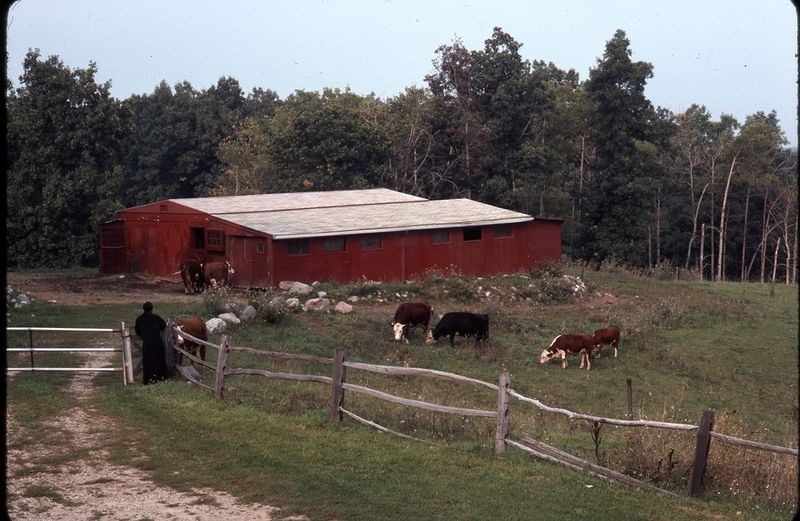 On the grounds of the monastery, which was a large horse farm before if was purchased by the Benedictines in 1959, was a building that was used as a dormitory for young monks or novices as they entered religious life. This was an old converted horse barn that had large dorm style bedrooms. You can still get a general sense of what this barn looked like by taking a close look at the current sleeping area. Fr. Dan presented the idea of a youth retreat house to the community and asked if they could convert this dorm into a retreat house. Large rooms were turned into small bedrooms, a kitchen and small gathering place was added. At the most this building could accommodate 20 people. Fr. Dan and Mary not only facilitated the retreats they were also the cooks. So was born the tradition of mostaccholi because it could be quickly prepared. Hot dogs were also a staple along with lots of popcorn. In 1988 ground was broken to expand and renovate Subiaco Retreat House. When a friend of the monastery, Bill Wizinski, an experienced architect, heard of the plan he generously offered his expertise. Moving into the retreat house he participated in programs so that he could get a sense of what was needed to create a space for youth that was functional and comfortable. Bill could not stop at simply adding on a dome. He designed a spectacular building that would meet the needs and habits of young people as well as allowing flexibility to the program. What was to be a simple hallway connecting the sleeping area to the gathering space in the dome, became the grand entrance we now have and a bridge that connects dorm to living room. The large open space of the dome was used to incorporate a chapel at the top of the dome where youth gather to celebrate Eucharist. He designed an arch that marries together the chapel and gathering space creating a focal point. A dining room and kitchen were built to serve 55 people. A large rec room was included in the basement of the dome. A fountain and glass house were installed in the area below the bridge. One of the most unique design elements are the many nooks where youth gather and talk, like the loft space that is filled with comfy couches and the raised steps in the rec room. The old retreat house area was redesigned to sleep 40 students with separate bathrooms for each room and sturdy bunk beds for rest. This is not your typical youth summer camp accommodations. For the first 20 years, Subiaco was facilitated by Fr. Dan and Mary Cummings with the other monks lending a hand when needed. In 1995 a young man from Puerto Rico joined the monastic community. Br. Anthony Muldanado is an accomplished artist. He has used his talent to adorn the upper chapel with beautiful paintings of angels, prophets, and scenes from the New Testament on the walls in the style of the great modern frescos like Diego Rivera. His use and mastery of color is breath-taking. Soon after arriving he joined Fr. Dan and Mary helping them facilitate the program. It was natural for him to add a session of arts and crafts which has become a favorite of many youth. He also prepares several meals enjoyed during the weekend. His scrambled eggs with the bacon built right in help everyone start Saturday morning with feeling of comfort. In 2000, Br Marty joined the monastic community. He was a chef for many years in the metro Detroit area and currently a high school teacher. Marty began helping Fr. Dan and Mary in 2002, giving them the opportunity to be more flexible in organizing their time spent at the retreat house. His youth and enthusiasm has helped diversify the program and added new ideas. Confirmation retreats were added to the program schedule. Our confirmation programs have quickly grown into one of the largest ministries at Subiaco. These 5 hour Sunday or weekday programs are geared toward 8th and 9th graders. Religious education directors and parents often call following a retreat and comment oh how much of an effect the retreat had on their child or students. With the opening of the monastery's new chapel in the summer of 2000 we are now able to accommodate up to 120 confirmation students. The chapel is a beautiful structure that takes advantage of the contour and height of the hill where St. Benedict Monastery is located. On a clear day you can look south past the rolling hills of Oakland County and see the Detroit skyline on the horizon 40 miles away. In August of 2011 Fr. Dan Homan passed away much to everyone's surprise and great sadness. There will forever be an empty space here where this priest who dedicated himself to his faith and to youth once stood. But it is with great hope that we continue the great tradition Fr. Dan began here. He always said that it was not the facilitators or the programs that made this a special place, but rather the work of the Holy Spirit filling the place and the hearts of all gathered with over flowing Grace. None of this would have been possible without the help and support of many good friends and benefactors. So many have been generous with their time and money donating everything from pillows and blankets, to plumbing improvement (hot showers are always nice), from rec room equipment to coffee makers. The staff and monks are forever grateful and know your generosity has helped many youth connect with their faith and community.